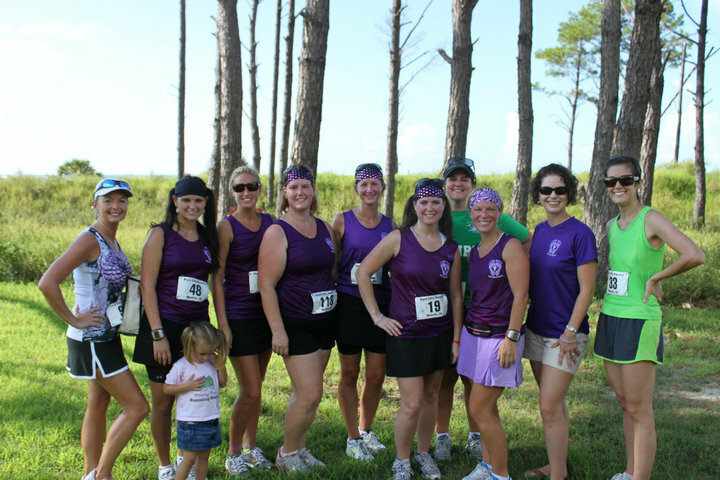 Road Runner Girl: Dauphin Island Hurricane 5K! Ok let me just vent first! This race was NOT my favorite at all! They served HOT water and by the time I got to the after party there was NO food left! And it looked like all they had in the first place was oranges. AND they ran out of cups! I was so not impressed! The actual run went great for me except for the fact that it was very hot and very humid. I finished with a time of 31:40! That's average for me...I can't seem to finish a 5K under 31 minutes. On a positive note...the t-shirts for this race were cute...they were blue! That's a nice change from all of those white race t-shirts! It was fun having all my Sole2Soul Sisters there with me too! This was our second round of the Couch to 5K. We didn't have as many ladies as we did the first time but that's ok. The ones that came did a great job! 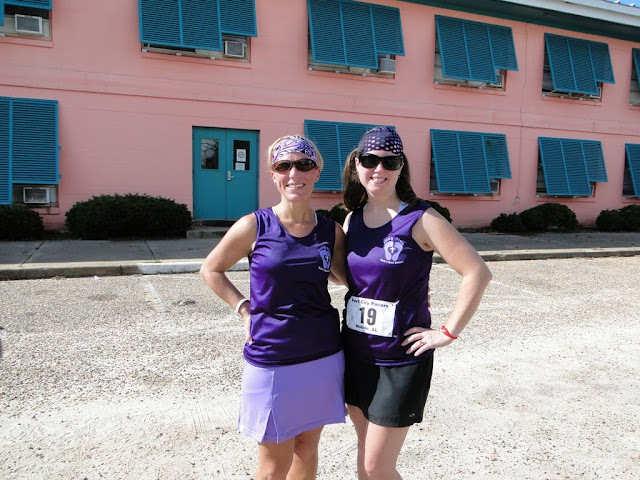 It is always fun explaining our purple shirts to fellow runners! After the run, a few of us decided to go eat somewhere since we didn't get any food. We ate at Dreamland BBQ...YUMMY! And another exciting thing...on our way home we saw a water spout! I saw it form and dissolve! Pretty cool...especially since it was from a distance lol! 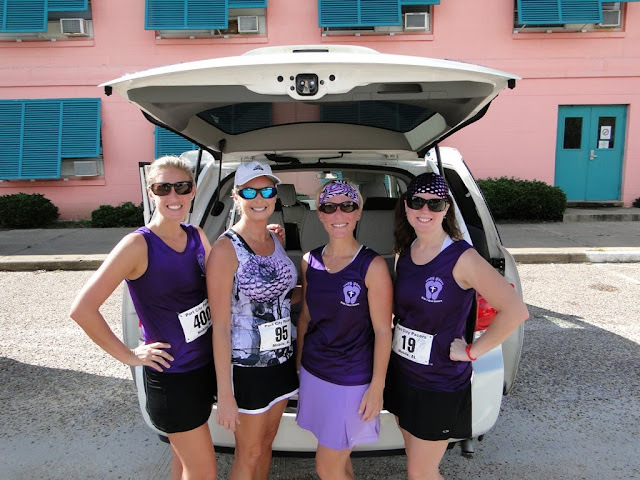 Some of us before the race! Of course Paige and I had to get our race day picture together! We have one together for every race we have both done! Some AWESOME ladies: Jennifer, Dana, Paige, and Me! Group shot of the Sole2Soul Sisters! 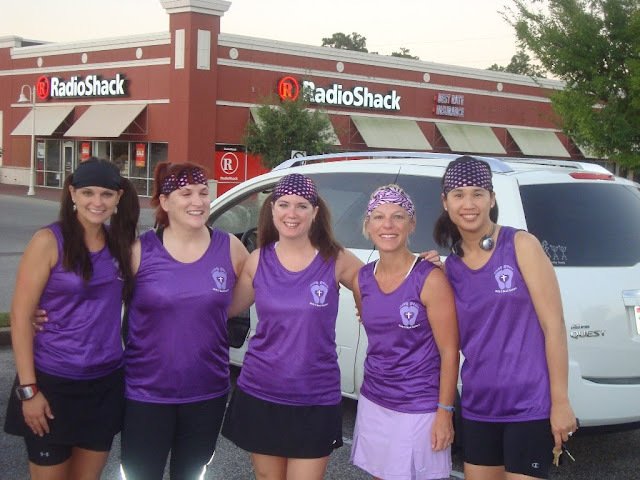 Just saw you were running the Pensacola half on the Distance Dreamers! Pensacola is my home from long ago. Just love it there! My two sisters live just outside of P-cola. Would love to chat more sometime....oh how I miss the beach! Awesome job, Minday, and a great run. Especially considering it wasn't the most ideal conditions! !